A marriage made in heaven indeed! Then there are all these weird children . . . .
Ha! Right on the money, I mean Mooney. Ha ha, very good. But Author, we haven’t stopped laughing at the previous one yet, give us a chance. Moses has a very promising future as a theologian. I hope he’s here to stay for a while. Indeed, he could have his own spin-off strip…. But…But…Theres some SCIENTISTS that are Xtian! That proves its compatible! First one thats made me laugh in awhile. Can the separate room that religion lives in be a functional gas chamber left over from WWII? I’d donate heavily to research into a rational-gas. Hm – married eh! So how many times must I say “I divorce you” to dissolve the relationship? funny this one. But i wonder when we could see the barmaid. I wonder what the barmaid looks like. Are she blond or maybe she is readhead. More like a marriage made during a drunken weekend in Las Vegas. Science is about doing your best to find out what is or is not true. 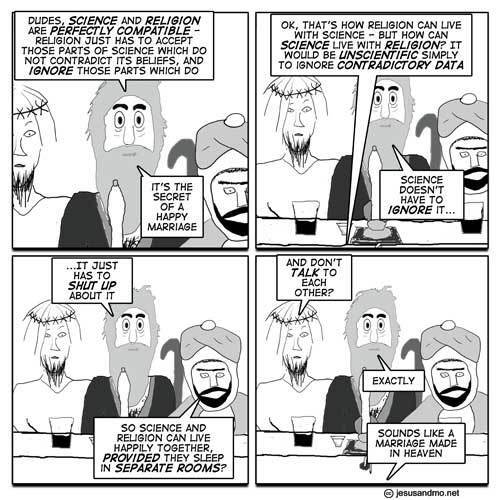 Religion is just making stuff up and pretending it’s true. Anyone who says that these two approaches to knowledge are compatible….. has just made that up and is pretending it’s true. Various churches have always (or, at least since the Enlightenment) selectively endorsed science, often after prolonged periods of hoping it would just go away, and usually when the tide of scientific opinion becomes too great to dam up with literal scriptural interpretation. Christians are then quick to claim the author of the newly accepted theory as one of their flock (see any number of “Is religion incompatible with science?” articles), glossing over the social and cultural near-impossibility of being a religious (or irreligious) non-conformist in mediaeval, renaissance and even Enlightenment Europe. It would be a bit like an Afghan scientist working under the Taliban regime, discovering a benefit of kite flying and music playing, and then stating he was an Atheist. Whereas if he argues for kite flying, etc. as a devout Muslim, with support from verses in the Quran, he just might avoid being executed. Stonyground: that comment was so good I had to save it to a text file. I may try to memorise it for later use. Stonyground: I also am impressed and might find occasion to use it. Attribution to you, right? By my estimate you have drawn 1500+ pictures of “the prophet” since beginning this comic strip. Jyllands Posten got fingered for just 8 (plus one or two extras added by pious imams worried the originals didn’t quite cut the mustard). How d’you manage to do that? Damn those devious mohamedans. That’s how they avoided a fatwah when adding extra cartoons to the Jyllands Posten set.